As many of you may know, we have a new thesaurus, one that looks into a problematic (yet SO important) area: Emotional Wounds. It’s somewhat intuitive to see how a traumatic event might spawn specific fears or cause flaws or attributes to form. What isn’t quite so clear is the relationship between a wound and a character’s basic human needs. So I wanted to shed some light on that. First of all, what are basic human needs? According to famed psychologist Abraham Maslow, there are 5 basic needs that every person needs in order to feel fulfilled. If a person—or, for our purposes, a character—is lacking any of these needs, they will set out to fill that void, beginning with the need that’s most vital. 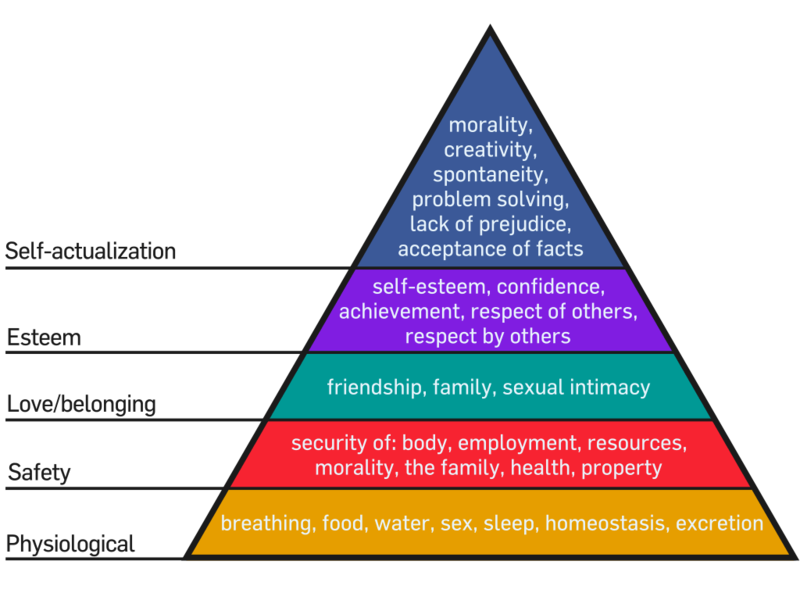 As the diagram below shows, the foundation of the pyramid represents our physiological needs because those are the most important; the need for food, water, air, and the like are obviously the most vital because without them we would cease to live. The next most important need is that of safety, followed by love and belonging, esteem, and self-actualization. So a character whose physiological needs aren’t being met is going to do whatever it takes to meet those needs. This is the heart of Character Motivation. Once that goal is accomplished, she’ll move on to the next most pressing goal. As an example, consider Erin Brockovich, from the movie of the same name. At the beginning of the film, she has no job and is struggling to provide for her family; she’s missing the safety need. So she scours the classifieds, interviews pretty much everywhere, and tells potential employers whatever they want to hear in an effort to secure employment so she can take care of her family. With no luck. Then she gets creamed by the doctor in the Jaguar. Medical bills pile up and she becomes so desperate that she walks into her lawyer’s office and just starts working, telling everyone that he hired her. You can see her pride taking a hit when the lawyer confronts her and, in obvious embarrassment, she quietly pleads with him not to make her beg for a job. This is the power of basic needs. When one is missing, it affects a character’s behavior and pushes her to do things she never would have done otherwise. Knowing which needs your character is missing can help you to write her believably because you’ll know what’s driving her on a primal level. So what do emotional wounds have to do with this? Angela has written an excellent post that explains the wounding event; if you’re looking for more information on what that is or need some guidance on choosing the right one for your character, please check that out. Once you’ve chosen an appropriate wounding event, the next step is identifying which needs have been compromised because of it. To clarify this, let’s look at a girl who was bullied repeatedly about her looks. Because of this bullying, her esteem is removed; the abuse diminishes both her view of herself and her perception of how other people see her. Even after the bullying is done, she still feels the pain associated with the loss of her esteem and will subconsciously take steps to meet that need or make sure that it isn’t threatened again. Maybe she’ll throw herself into education, sports, or the arts as a means of gaining recognition for herself, since she feels unable to compete physically. Perhaps she’ll become overly flirtatious or promiscuous, seeking attention from others as a way of feeling desirable. She might even become a bully herself, valuing her power over others because it brings a measure of respect from her peers. See how wounds and basic needs are related? The former inevitably impacts the latter. So when you’re looking into possible emotional wounds for your character, always take into account the needs that have been diminished or removed because of those wounds. This information will help you to create and write characters who make sense and resonate with readers. For more information on Emotional Wounds and how powerful Unmet Needs will trigger a inner transformation within the character, take a peek inside The Emotional Wound Thesaurus: A Writer’s Guide to Psychological Trauma. This entry was posted in Basic Human Needs, Character Arc, Character Wound, Characters, Experiments, Motivation, Uncategorized, Writing Craft, Writing Lessons. Bookmark the permalink. Looking forward to this, Becca!! Thanks Manju–I will be sure to check that out! Every writer needs to read your post. I can see how the Emotional Thesaurus can help a writer go deeper and more fully into a protag. or antag. personality and character arc. Thanks for another great resource. I really like thinking about my manuscripts in terms of emotional wounds and the drive it creates in my characters. So glad this helps, Theresa! Great and helpful slant on a character. I will read it again more slowly and determine how this applies to my characters. Thanks so much for this post!